In the Ditmar awards, Sea Hearts is up for Best Novel, "Significant Dust" from Cracklescape is nominated for Best Novellette and Cracklescape itself is up for Best Collection. Sea Hearts is also up for the Norma K. Hemming Award, which will be awarded at the same ceremony next weekend at Conflux, and which "marks excellence in the exploration of themes of race, gender, sexuality, class and disability in the form of science fiction and fantasy". These are named after Norma Kathleen Hemming (1928–1960), fan, actor and writer of science fiction and fantasy. Sea Hearts is shortlisted in the Children's Book Council Awards this year, too, for Book of the Year: Older Readers. Winners will be announced on the third Friday in August. And the NSW Premier's Literary Awards shortlists have been announced, with Sea Hearts included for the Ethel Turner Prize for Young People's Literature. The winners will be announced at a dinner at the State Library the day after the Aurealis Awards night. I know, it's Shortlist Central around here. There was a wonderful celebration in Melbourne on Tuesday night to announce the winner of the inaugural Stella Prize. The entire shortlist was flown in for the occasion, and both Helen Garner and the winner, Carrie Tiffany (for Mateship with Birds) delivered terrific addresses. Carrie also donated $10,000 of her $50,000 prize among the five other shortlistees, which was a total surprise and very kind of her! 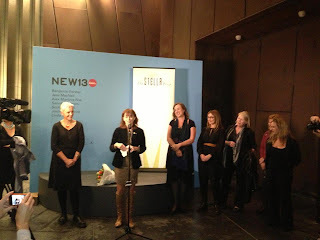 Here she is accepting her prize, with the shortlist either side of her (Michelle de Kretser is there too, behind the camera on the left—there was TV coverage on the ABC and SBS news), in a photo taken by Demet Divaroren. It's really wonderful to see Margo, Margo everywhere. Fantastic recognition for a totally wonderful writer.